After my father, I reckoned my school days account for the most memorable and transformational phase in the curve of my life. 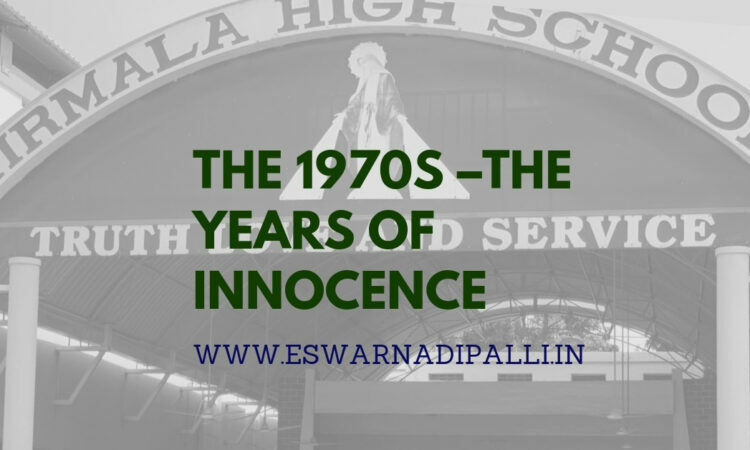 I have saved spectacular memories of the 70s during which I got through my secondary certificate board exams with one mark extra to get qualified as a first class. I hardly remembered anyone excited to shake my hand or chatted about my achievement and cared to part a smile. Gladly, in those days’ high tally of grades and straight A’s never measured as any worthwhile talent. Parents are happy, never pressed for marks and keen that we are what we are – children – all the while manageable and obedient. I don’t exactly remember who accompanied me when I got admitted to nursery grade at Nirmala High School, in a small town of Vijayawada, in the South Indian state of Andhra Pradesh. I was four years naivety. It was in 1964, my father wasn’t with me then, and he was to return to his native place Vijayawada four years later from the USA after completing his doctoral research. I hardly have to walk twenty minutes to reach the school from home. It has a narrow path leading to the school shoddily lined by a long row of thatch-roofed and soot-colored hutments on one side, and an open water channel that flowed all along the school boundary wall. And after a few meters down merged with the main canal: a major water source to hundreds of acres of paddy fields spread beyond the school and our home. Evening hours after school seemed tougher than the stress-free coaching I enjoyed in classrooms. Once upgraded to primary class, promptly after school sessions, my dad supervised at home the homework and assignments, scrutinized the notes, and the chapters have done with. The whole scene, it looked so archaic, as I sat cross-legged squatting on a mat neatly spread on the floor. I have to curve forward my whole back like a twig – to read or write anything and as the dusk deepened the setting was complete with an old incandescent bulb dangling carelessly by a free hanging wire. It swung freely as a source of a faint yellowish glow what I could afford for night study. With its well-planned playgrounds, bright and bustling classrooms combined with its ‘healthy for children’ surroundings, Nirmala High School was a missionary outfit. Somehow the school turned out itself to be my salvation, and as I arrived at higher grades. For over twelve years I have stayed in the school I got deeply attached to its charitable outlook and the righteous zeal. And for the many nuns who had taken positions as teachers in various subjects. I grew so reverential for their ethics, values, and passion, and how they engaged our noisy bunch of Co-eds’; and, young-at hearts; our class of 76. It is here that I have learned to read and write. I found their devotedness always as white and bright as the habits they wore to the classes. Even today, when I take confident strides into the school, forty years later, the school that made me what I’m today, memories explode deep inside. I celebrated even today for the teachers – the souls of good deeds, reverence and respect, who are now in their seventies. I kneel before them, whom I felt were the personification of love and lasting care. In the long corridors, the well-stocked library, our weekly singing, drawing, and craft classes all well designed and planned into our liberal curriculum. I obediently memorized the lessons, completed my assignments and learned the counsels of discipline from our Headmistress Sr. Angelica Fernandez, – who later settled in Hong Kong. Sr.Nancy, our class-teacher for over eight years, an ever-smiling, kind-hearted and a genteel soul; taught us two moral codes of life. One the value of friendship, and the other how to respect and treat ‘ the girls’ as equals – around twenty in the group then as our classmates. You run, jump, and hop until your shirt drips with sweat. Table-Tennis, badminton, basketball, mass-drill, periodic outdoor sports events; all schools days were affluent with sporting and leisure activities big and small. Sr.Mercy John was our Physical education in-charge. She fastened our minds, bodies, and souls wholesomely to a strong and spirited orbit. I carried a thoughtful vision she had had, for all of us as a coach, forty-five years ago. What I wished to highlight was how transformational it had been the reverential sisters’ involvement. It’s a gift of a lifetime of well-being –both physical and emotional. It’s with their simple lifestyle, diligence in teaching, moral fortitude, I recall, they taught us how to live and lead well. There was the structural and functionality of the entire school that worked in tandem that has elevated all of us to the loftiness of success where most of the alumni find themselves today. Until my math teacher Mrs.Prema Raghavan, had brought to the school, soon to become a rage, a cassette tape-recorder, I never imagined pop-music would be easy on my ears. I couldn’t take my eyes off from that ‘a big book size’ music playing gadget. She pressed the play button on the machine; a racy English melody tickled my senses. I came to know, later, the song titled, ‘Mama-Mia’ sung by a Swedish group introduced to the western pop music lovers as ‘ABBA’ in 1974. I favored since then and enjoyed the melodious world of pop music. Even today Abba songs, their lyrics, and their floating melody provided calming ambrosia when my moods turned dark and down! At the times, five decades back, my home environs were too naïve and primitive if I recollected rightly. All in all, four uncles and aunts and double the number of cousins of assorted age groups from four-year-olds to college going siblings were put up in our ancestral home. It is impossible today; even to make a wild guess, how the minimum conveniences like one small restroom and equally small layout for scrubbing attacked by so many adults and wannabes every day without tension and ruckus: no gas appliances and no grinders, no telephone. Cooking was on a kerosene stove, and they used wood and coal when kerosene woefully rationed. I lived on the first floor, and my routine chores were more laborious than my cousins who enjoyed the ground floor. Every morning my routine included to draw water from a small well at the far corner of the house, enough hauled and stored sufficient for a day and carried it all the way, to the first floor, walking all around the house to four feet by four feet storage place did crudely with red bricks. It’s an antique living sketch – with no electric motors or tap connections to help me out in those days. There was no notion of entertainment and recreation. Television or radio corruptingly hasn’t yet descended among the teen demography. We hardly discussed social and political issues. I haven’t ever visited a movie theater nor had the pleasure of enjoying a movie until I was sixteen. It was with three paise; I was to be content with, as a bribe, to stay all by myself, no irritating tantrums when my parents had an outing. Five decades ago, three paise to young ones, encouragingly, had enough buying scope. Shiny, loose, variegated marbles slipped into both my pockets of the shorts clinking and rattling as I ran down to play, on dirt and gravel street, along with neighborhood kids. We used to play with marbles, hunched on the dusty ground until our hands hung crusted with dirt and mud. I played until dusk, darting one eye at the far end of the street if I could catch my dad on his bicycle. If I spotted him, I hurriedly would dash into the home, to emerge clean before he discovered how badly I’m ‘undisciplined.’ The reckless self I carried myself of the nostalgic past – a far cry that any present-day kids could fathom how primitive and restrictive, yet gloriously enjoyable and emotionally contended my childhood ordeals had been. If I measured my fifty years of the remarkable ride, it gives me a sentiment of blessedness I have pulled together: volumes of good fortune and bad fare; bounties and brickbats; gains and failures; and success and negligence. But I have to be grateful for the few charms that have sailed along with me, from my school days; fastened like miraculous lifesaving shock absorbers: good friends, books, discipline and an ear for lovely music – what comprises my daily rejuvenating toolkit.